Traveling with kids: so much fun, and so many chances for disaster. Right? We’ve had our share of both, from those magical moments when everyone’s laughing together and I’m wondering how I ended up with such amazing kids, to that time when we dragged a screaming two year old around Old Faithful while everyone else stared at us, wishing we’d disappear. Through all our trips, I’ve discovered one tip that makes traveling with kids about a thousand times easier. 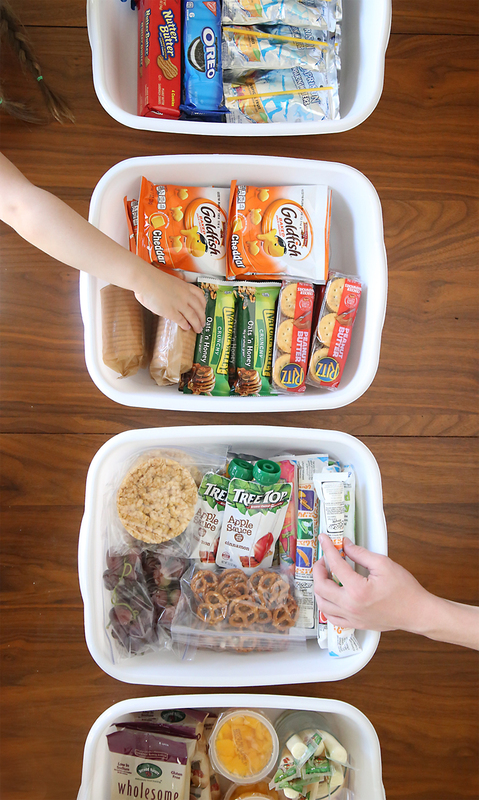 Before your trip, prep a WHOLE BUNCH of snack size baggies filled with (mostly) healthy snacks. 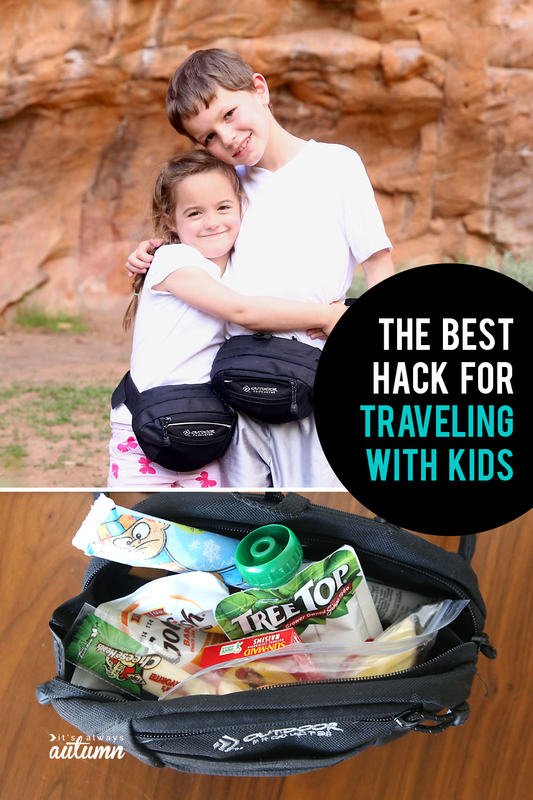 Then get each kid a fanny pack and let them load it up with snacks each morning, which they can eat whenever they’d like during the day. * Seriously, this solves all sorts of travel related problems. Because, after all, what’s the biggest issue when traveling with kids? Well, they get off their schedule, they’re in unfamiliar places, they end up tired, and then they get CRANKY, and suddenly everyone else is miserable. 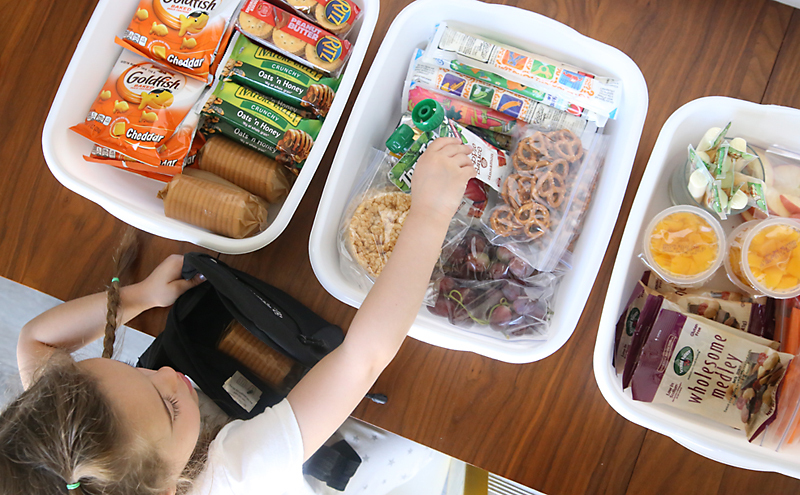 Giving kids some autonomy by allowing them familiar food choices and ensuring that they aren’t hangry will go a long way toward making your trip more magical. Oh, and it’s going to save you loads of money, too. This little tip is an absolute life saver if you’re headed to a theme park. Theme parks are notorious for long lines and expensive food, and a fanny pack full of healthy snacks will save your bacon in both situations. The wait for rides is a lot less miserable if each child has a cheese stick and applesauce to snack on, and you won’t have to drop $8 every time someone gets hungry (which, with little kids, is approximately every 23 minutes). 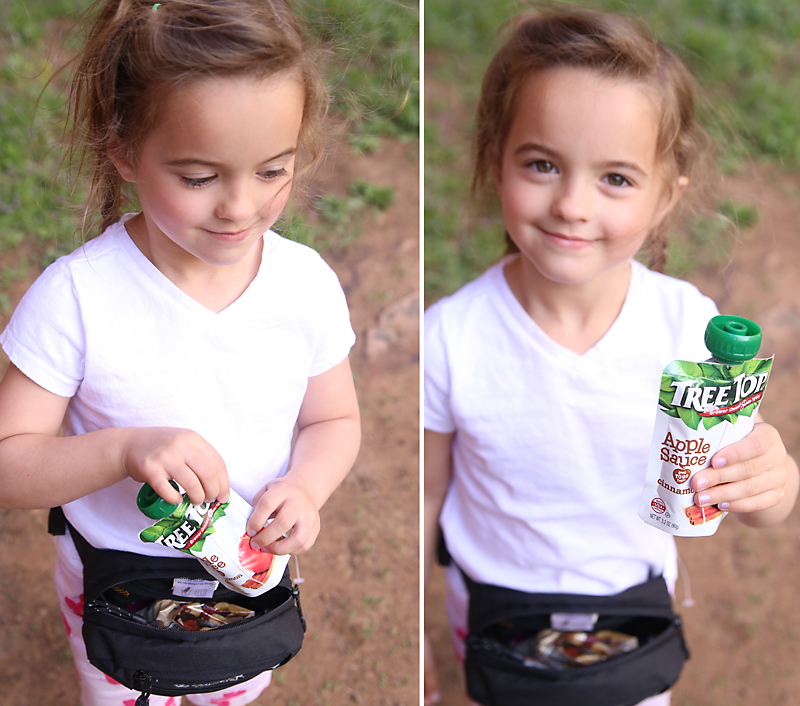 Plus, with each kid carrying their own fanny pack, you don’t have to lug all the food around yourself! 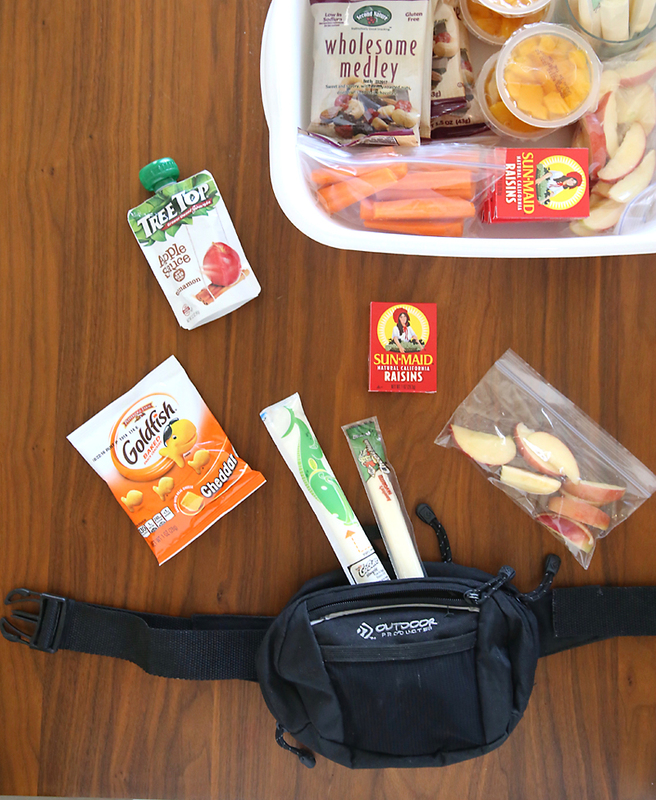 Snack packs come in handy on any sort of trip with kids: in the car, on a plane, at a national park, etc. Even at Grandma’s house, because there’s no guarantee she’s going to have the “right” kind of granola bars. If you’re flying to your destination and don’t want to check a bag full of snacks, check with the grocery stores near your hotel. Many stores (especially in tourist destinations) now offer free grocery order and delivery service, which means you can order a bunch of stuff in advance and have it delivered to your hotel when you arrive. *Quick note: I don’t usually recommend letting kids eat because they’re bored. In fact, we all know that’s a pretty big no-no. And I don’t usually let my kids decide when and what to eat all day long, either, because I know they won’t always make the best choices. BUT for five days out of the year, I’m totally good with this approach, especially if I make sure most of the snack options I’ve provided are healthy. 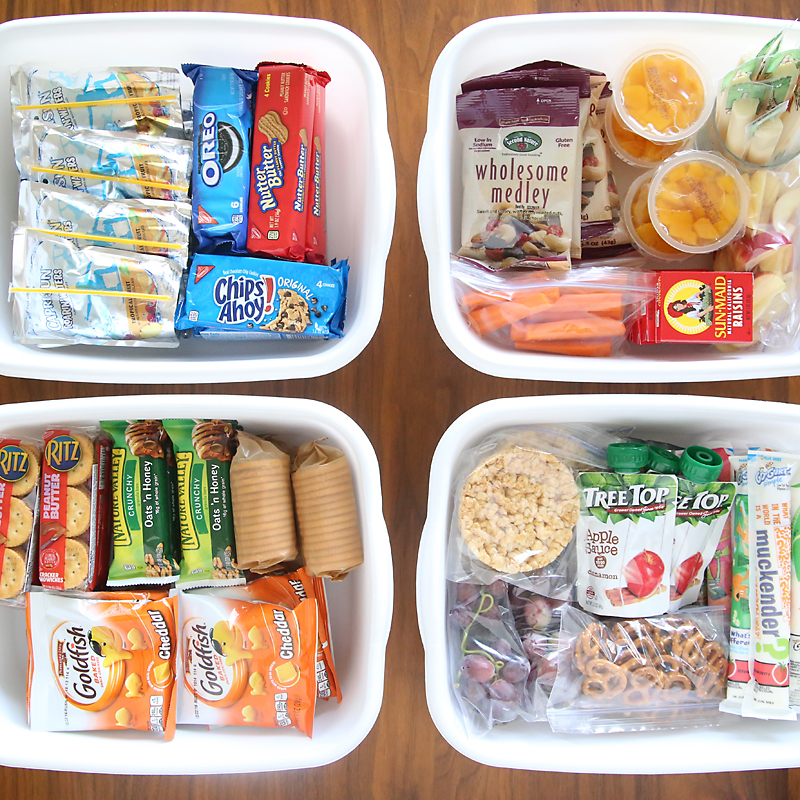 I do include some treats along with the snacks, but the kids can only choose 1 of those per day, while they can take as many of the healthy options as they can fit in their pack. I’ve found they do an surprisingly good job of regulating when to eat the food, especially if they know they can’t refill their pack until the next day. The best items to buy are things that will stay good for a few days and not get crushed when put in a pack. You can buy items already in single serving pouches, or just do what I do and buy a whole bag of things and divide them up into snack sized bags (the kids LOVE helping me with this before we leave). I hope this helps you out on your next trip with the kids! Click here to get tips for what to do if your kids will miss school for your trip. 37 best Disneyland hacks for your best vacation yet! This is pretty much the greatest traveling with kids hack I’ve ever seen. I can foresee it solving so many problems. Can’t wait to put it to use this summer. But which fanny packs did you buy? I need some because I love this tip! Will you email me? Great ideas! How about a fanny pack hack? I’ve often thought that it would be a great idea. I fixed the basic school backpacks for hiking, with the chest strap, and they get to carry their own water, lunch, and jacket, but a fanny pack would be better for snacking while walking vs stopping to take off backpack. I use to do something similar with my little ones, now 54, 46, 44 & 43 :~) One extra tip for younger children do NOT put their name on their bag, clothes, hairband. If someone knows your name they are not a stranger. Wasn’t such a problem with my children but someone approached my Great Granddaughter (age 3) in the park, calling her name which was clearly visible on her bag. She was ok, we were close enough to pick her up but it was scary. Hi! Great tips! You can also try some water infuser bottles. Try some strawberry, or lemon and infuse them on plain water. Kids will surely like it. Thanks and have a great day! This might even be a good tip for summer in general. 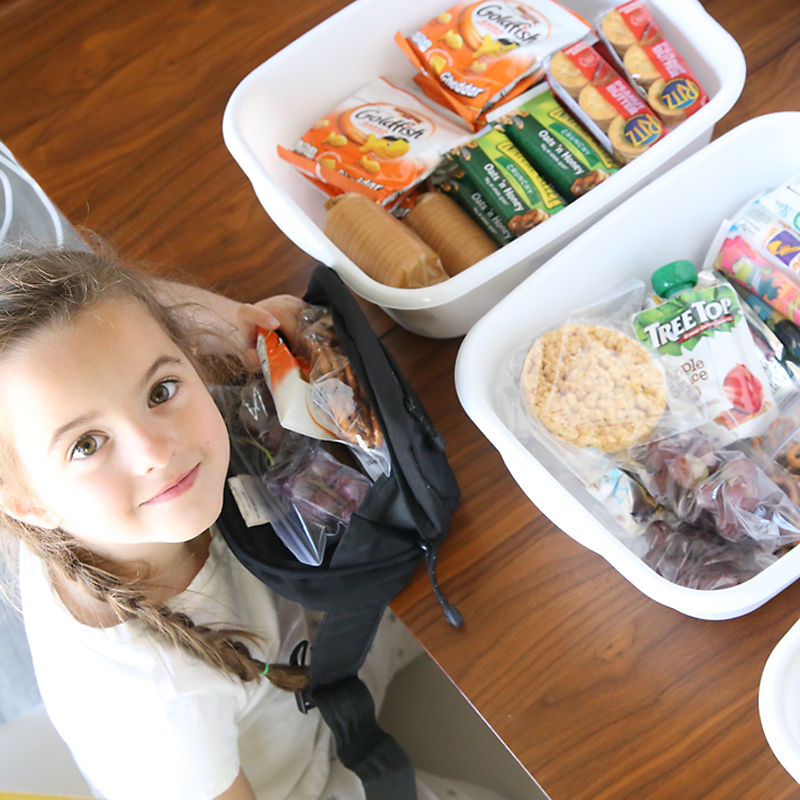 My kids ask every 5 minutes for a snack…maybe this will keep me sane and I’ll just use a lot of fruits and veggies and only a few carby things. When it’s out, it’s out. Ate it all by 10am, tough luck. This might even help them realize they aren’t hungry to the point they sometimes think they are; it will help them learn to space it out I think.